Why choose the Investment Casting process? One of the oldest known metal-forming techniques, investment casting or lost wax process casting is a complex and multi-step cast manufacturing process. An initial wax pattern of the part to be cast is coated with a ceramic refractory material and fired. The wax is then melted out to leave a ceramic cavity, into which the molten metal or alloy is poured. Upon cooling, the metal solidifies and the ceramic mold is broken out, leaving behind an exact duplicate of the desired part. Investment casting enables the fabrication of near-net-shaped metal parts with complex geometries and intricate details, from almost any alloy. In addition, parts that are investment-cast have excellent surface finishes and require very little secondary machining; they also allow for tighter dimensional tolerances (typically, a linear tolerance of ±0.004 inches is standard). Investment casting is therefore used in the manufacture of extremely complex parts that use specialized alloys or need a lot of machining, and/or which cannot be produced by traditional methods. Although investment casting is more expensive than other comparable casting techniques, the expense is offset by savings in material, labor and finishing. Almost any small metal part can be manufactured by investment casting. That said, it makes most economic sense to use the investment casting process for metal parts that have complex shapes, designs or are difficult or nearly impossible to precision machine. Due to the low material waste during the production process, investment casting is also suitable for the manufacturing of metal parts made of expensive alloys. Investment cast metal parts can be of lower weight, require less machining, and offer greater design flexibility as compared to parts made through other processes. However, not all parts can be manufactured through investment casting. Read on to see how investment casting compares to other metal working processes to determine the process best suited to your needs. Other casting methods such as die casting, sand casting. plaster casting and permanent mold casting result in similar benefits as investment casting, such as smooth surfaces and the ability to make thin-walled, complex pieces. However, the tooling costs in the die casting process are higher, making it more suitable for high-volume production runs. Sand casting is one of the cheapest casting methods, and is suitable for the manufacture of large components in low-volume runs. Plaster casting offers better accuracy, and a much smoother surface finish as compared to sand casting; it is cheaper than investment casting, and is hence most suitable when the quality of the surface finish is an important requirement. Some components, especially those with complex internal geometries and passageways, cannot be created by machining. However, where either process is possible, the choice depends on various factors such as volume of production, use etc. Machining provides the greatest precision of all processes, and allows for much greater dimensional tolerances as compared to casting. Therefore, where strength and precision are crucial, machining is a better choice. It is quicker and cheaper to mass produce castings, and there is much less waste as compared to forgings. However, ounce for ounce, forged parts have greater tensile strength, and up to six times the fatigue strength of a cast part. Hence, in applications where strength and ductility are crucial and cost is not as great of an issue, forging is the process of choice. Investment casting provides greater design flexibility, such as variations in thickness, tapering etc. as compared to stamping. However, stamping dies are less expensive, and will last the entire life of the part. The stamping process is also quicker as compared to the casting process. Thus, stamping is suitable for high-volume, hard metal parts. 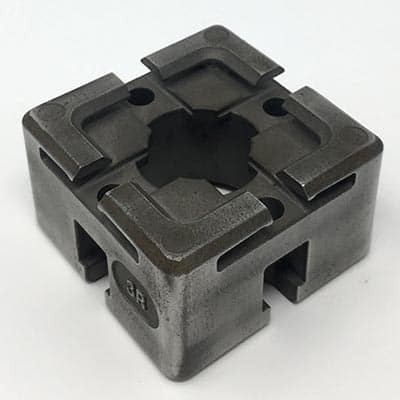 Both the production costs and the tooling costs for PM are lower than for investment casting, and the process is therefore suitable for high-volume production of simple shapes. Investment casting is a better option for components that require a higher degree of precision, have more complex shapes, and which are produced in low-volume runs.